During the mid-20th century, the race to space was in high gear. After years of preparation the first nations made it to the finish line. Following the Soviet Union and the United States, Canadians celebrated a proud moment in history after successfully launching their first space satellite, Alouette-1, becoming the third country in space. Shortly after its creation in 1958, National Aeronautics and Space Administration (NASA) invited Canada to collaborate in its satellite program. Two Canadian scientists from Canada’s Defence and Research Telecommunications Establishment (DRTE), John Chapman and Eldin Warren, promptly responded with a proposal to design and build a Canadian satellite that could monitor Earth’s ionosphere (a layer of Earth’s atmosphere) and the aurora borealis (Northern Lights). 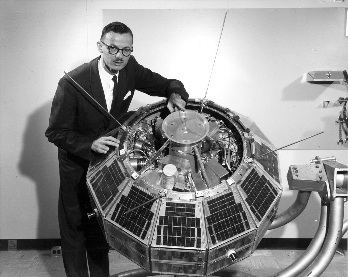 The proposal was approved, and Chapman and his team of DRTE scientists got to work on the design and construction of two identical satellites: Alouette-1 and Alouette-2. After three and a half years of work, Alouette-1 was ready. On September 29, 1962, the 320-lb satellite was launched from the Pacific Missile Range in California. Designed to last only one year, Alouette-1 surpassed expectations by continuing to operate for a decade, capturing over one million images. Following this success, Canada and the United States joined forces, launching a new program called the International Satellites for Ionospheric Studies (ISIS). Under the ISIS program, three other satellites were successfully launched: Alouette-2 (1965), ISIS I (1969), and ISIS II (1970). The data collected from these satellites supported over 1200 scientific papers on the physical processes of our upper atmosphere. The success of Alouette-1 marked the beginning of a strong relationship between not only Canada and the United States but nations all around the world. Space and planetary science and exploration has become one of (if not the greatest) examples of international partnership and cooperation. This historical moment was just the first of many. Canada has become a world leader in space science and technology. To learn more about some of Canada’s greatest achievements take a browse through the Canada in Space timeline. Dr.John Chapman showing Alouette-1 at the research centre in Ottawa, 1962.